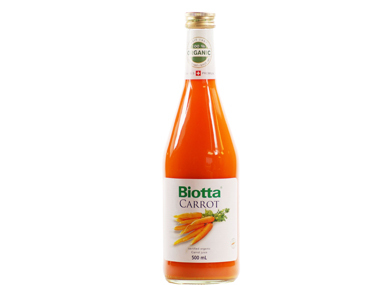 Order Biotta Carrot Juice - Organic from the Online Health Food Store UK. Buy Biotta Organic Carrot Juice 500ml and other quality Juices & Soft Drinks safely online in the UK. This traditional juice is rich in natural beta-carotene/ provitamin A. Vitamin A helps maintain good eyesight. Our UK Health Shop sells real Biotta and other Juices & Soft Drinks from top-quality brands safely online to customers throughout the United Kingdom in England, Wales, Scotland and Northern-Ireland. View more products on the Online Health Food Store from Biotta. Where to buy Biotta Carrot Juice - Organic safely online? Shop at the Online Health Food Store if you are wondering where you can buy Biotta Organic Carrot Juice 500ml safely online in the United Kingdom.